Welcome to the dog days of summer! They are even better when you get to bring your best friend along with you. Here are some ways you can beat the heat and get those tails a-wagging. In Bend, cool off right downtown on the Deschutes River on a Stand Up Paddleboard at Riverbend Park. Many four-footed swimmers will ride along, and will definitely enjoy the park’s off-leash area. Sit: Enjoy a cold pint on the dog-friendly patio at 10 Barrel Brewing’s pub. Stay: Check into elegance at The Oxford Hotel, which welcomes guests of the canine persuasion. 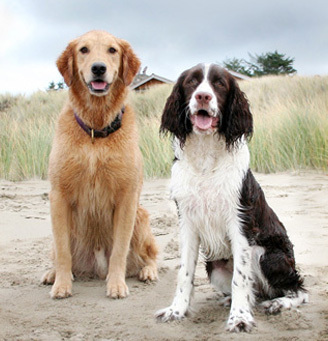 Start your game of fetch at Siletz Bay beach in Lincoln City. It’s great for long walks, beach combing and viewing other local barkers — lounging harbor seals. Sit: Dish up at Nelscott Café with homemade breakfast and lunch options — plus free fresh water and a K9 menu for your pup. Hit the trail for a shady hike on the 7-mile Dog River Trail near Mt. Hood. The trail crosses Puppy Creek and then follows the Dog River to several jaw-dropping viewpoints. Sit: Fuel up beforehand at Dog River Coffee in downtown Hood River, or stop in at Solera Brewery in Parkdale, where your pal is welcome to sit out back and enjoy views of the mountain. Stay: Pitch a tent at one of the dozens of campgrounds in the Mt. Hood National Forest.